All whales are protected under the Marine Mammal Protection Act and blue, humpback, fin, sperm, and western North Pacific gray whales are listed as endangered under the Endangered Species Act. NOAA's National Marine Fisheries Service (NMFS) has regulatory responsibility for implementing these laws. Whales in a national marine sanctuary are also protected under the National Marine Sanctuaries Act through the prohibition of take (to harass, hunt, capture, or kill) of any marine mammal, sea turtle, or seabird within or above the sanctuary. NOAA's Office of National Marine Sanctuaries and NMFS work collaboratively on a number of actions to advance NOAA's broad objectives. Both agencies also work independently on individual program goals. An effective way to reduce ship strikes is to reduce the co-occurrence of ships and whales. 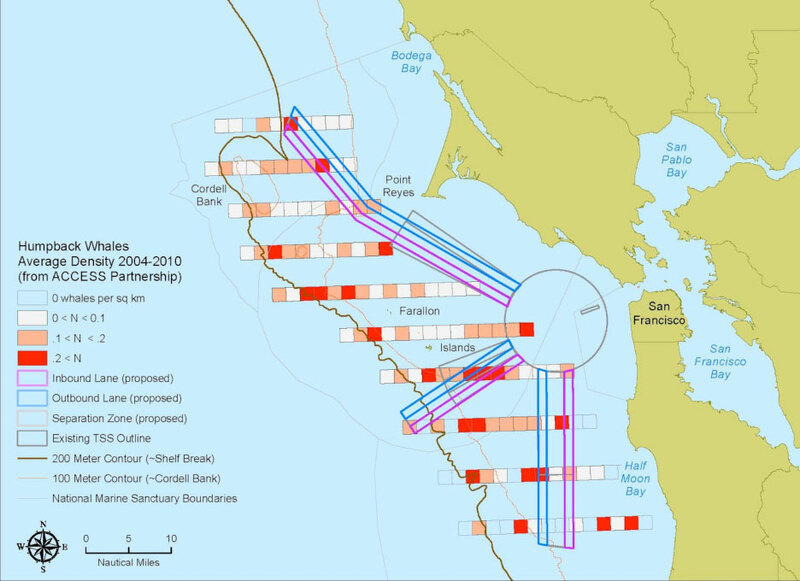 West coast sanctuaries, Cascadia Research, NMFS, Point Blue Conservation Science, SCRIPPS Institution of Oceanography, and others have worked together to shift shipping lanes away from known areas of high whale aggregations. CINMS, CBNMS, GFNMS have successfully worked with the Coast Guard to modify the International Maritime Organization's (IMO) shipping lane approaches to the Los Angeles, Long Beach, and San Francisco Bay ports thus reducing the co-occurrence of ships and whales in the San Francisco Bay area and Santa Barbara Channel. The revised California traffic separation scheme went into effect on June 1, 2013. The IMO is amending the Traffic Separation Scheme (TSS) in the Santa Barbara Channel and the approach to the ports of Los Angeles and Long Beach, effective June 1, 2013. 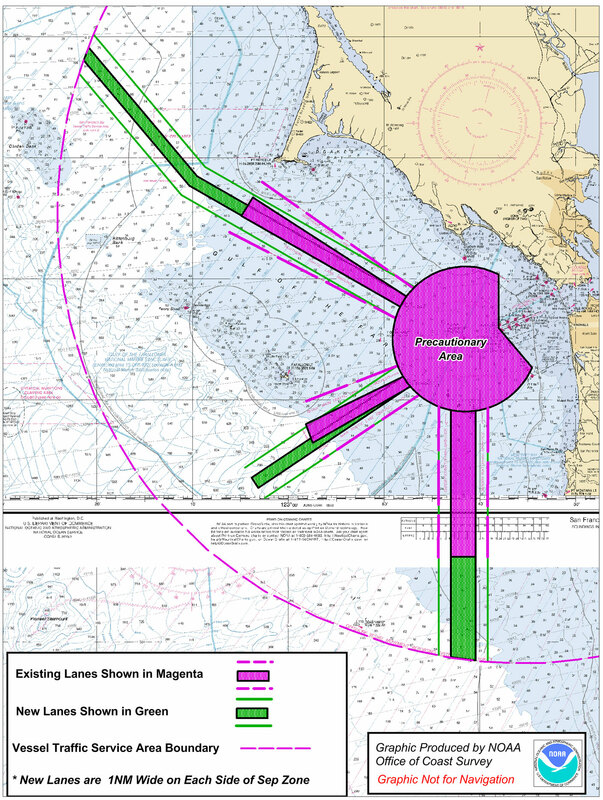 The TSS amendment will reduce the width of the separation zone from 2 nautical miles (nm) to 1 nm by shifting the inbound lane shoreward and away from known whale concentrations. The outbound lane will remain unchanged. Narrowing the separation zone is expected to reduce co-occurrence of ships and whales while maintaining navigational safety. 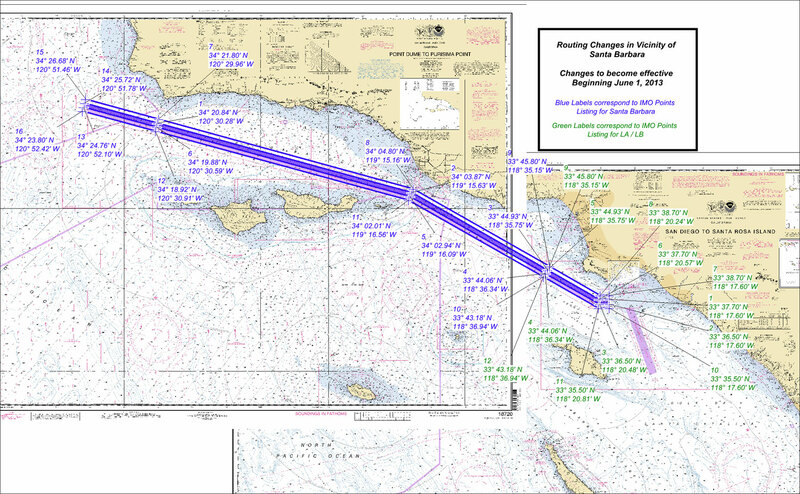 NOAA chart showing the Santa Barbara Channel Traffic Separation Scheme adjustments. Click on the map for a larger view. The IMO amended the San Francisco TSS effective June 1, 2013. The San Francisco TSS is located within the CBNMS, GFNMS, and MBNMS as well as numerous commercial fishing grounds. The USCG maintains a Vessel Traffic Service (VTS) in the port of San Francisco, and the TSS is located entirely within the VTS coverage area. The TSS adjustments will be made in an effort to enhance navigational safety and reduce the co-occurrence of whales with commercial vessel traffic. To view the USCG Local Notice to Mariners please click here. For additional information on the TSS amendments see the enclosures section of the USCG Local Notice to Mariners. 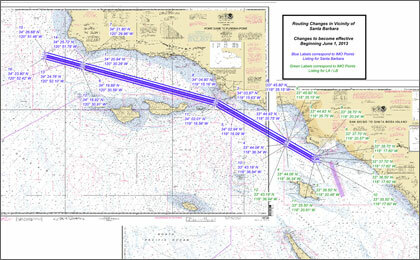 NOAA chart showing the San Francisco Channel Traffic Separation Scheme adjustments. Click on the map for a larger view. The Santa Barbara Air Pollution Control District, Environmental Defense Center, and west coast marine sanctuaries propose financial incentives for voluntary speed reductions in the Santa Barbara Channel thereby reducing greenhouse gas (GHG) emissions and mitigating the potential for injurious or lethal ship strikes. The incentive funding would come from proceeds from California's cap-and-trade auction proceeds. Click here for more information on the above proposal. 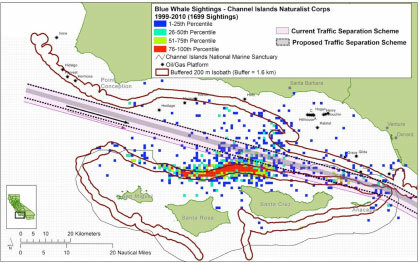 The West Coast Region sanctuaries continue to work with staff from NMFS, U.S. Coast Guard and National Weather Service to provide seasonal notices and whale advisory zone chartlets to mariners when large whales have returned to the Channel Islands area and the entrance to San Francisco Bay, including Gulf of the Farallones and Cordell Bank (chartlet and regional notices provided here). 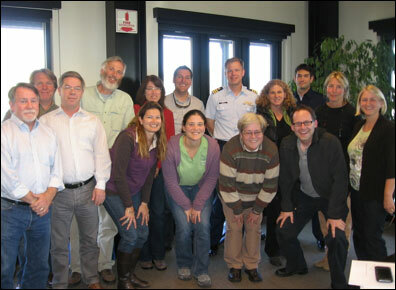 The Sanctuary Advisory Councils of Cordell Bank (CBNMS) and Gulf of the Farallones National Marine Sanctuaries (GFNMS) facilitated the Joint Working Group on Vessel Strikes and Acoustic Impacts in 2011 that provided recommendations on research, education, and policy actions to protect whales. The joint working group's recommendations are available under "Reports and Documents". 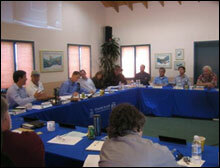 Channel Islands National Marine Sanctuary (CINMS) Sanctuary Advisory Council convened a similar subcommittee in 2009. The subcommittee developed similar recommendations on how to reduce the threat of ship strikes in CINMS. The subcommittee's recommendations are available under "Reports and Documents". 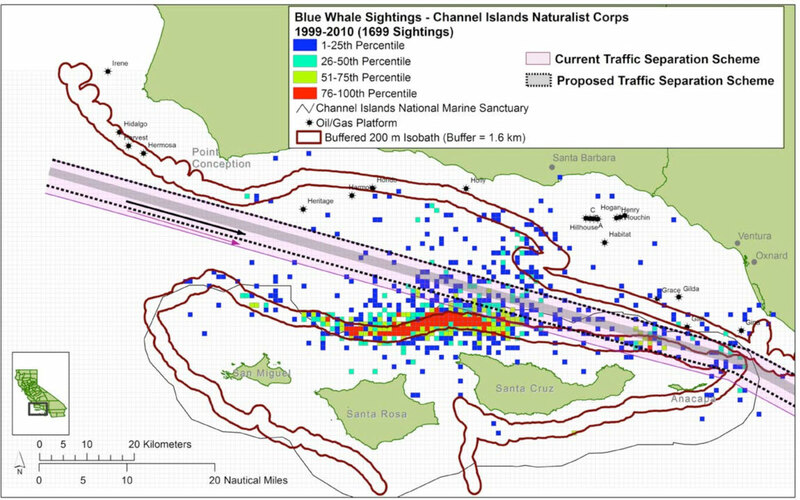 Blue whale sightings and the shipping lane shift in the Santa Barbara Channel. Click on the map for a larger view. 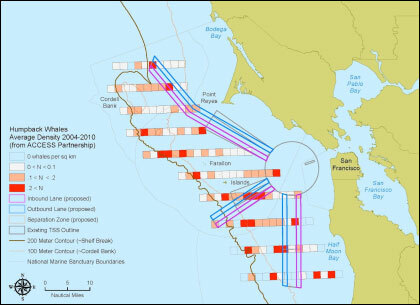 Humpback whale sightings from ACCESS , with the new shipping lanes in the approach to San Francisco Bay. Click on the map for a larger view.